Font type used: I chose these designs because I like how complex they are to label within a type category . Clearly they have decorative elements; however, those elements seem to be imposed on top of the actual typeface. The typeface used looks Sans Serif, however there are elements where BaBoon tweaks the letterform to create his character representation within the glyph that Serif-like projections (IE: The capital T in the sesame street design). I really like the creativity that BaBoon used to capture the characters in the Harry Potter and Sesame Street (Muppet) worlds. I think it is a highly unique concept, however I don’t see people using BaBoon’s creation within their own designs. The practicality of usage is highly skewed. Readablity as a whole would be a problem. I think people would be more captivated by the designs within the font instead of trying to piece together words that they create. Legibility, for the majority, is really good. The letterforms, for the most part, stand out. However, there are a few letters (like the lowercase z in the Sesame Street design) that seem too caught up in create the character they represent instead of trying to portray the letterform within that character. Plus, there is a point where the decorative elements in the font seem to create a problem with leading between lines. 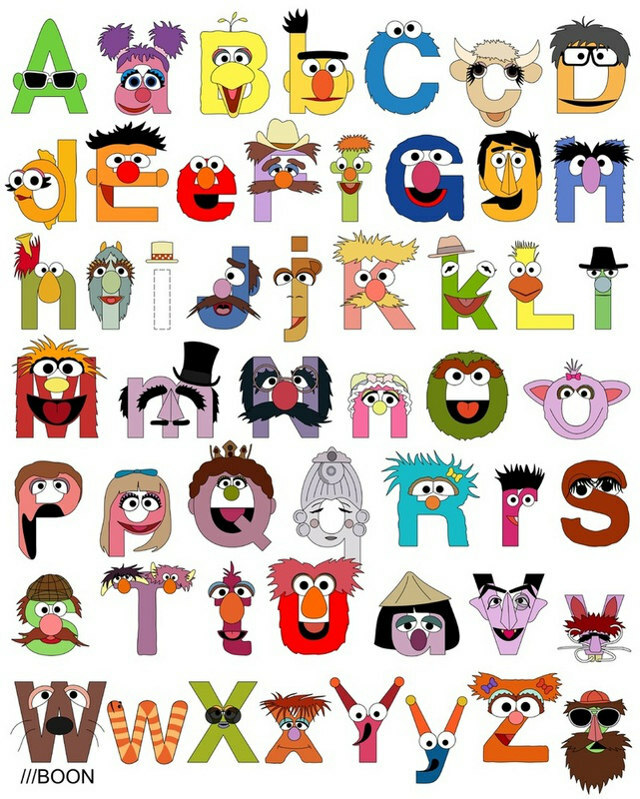 For example, once again in the Sesame Street design, the lowercase q and the uppercase U overlap. This seems to further my point that practicality of usage is a downfall. I prefer the Harry Potter one better. For some reason, it seems more refined and professional looking to me. I looked it up on BaBoon’s site and noticed that he created the Harry Potter one after the Sesame Street design. I think that the Harry Potter design shows just how far BaBoon’s skills have evolved since he created the Sesame design. The formatting of it all is good. Creating the character off of the original letterform was a good idea, and the way he did it seems to create a clear representation of the character they are supposed to represent. Still, the practicality of it all creates issues with formatting. I do not see either of the Harry Potter or Sesame Street fonts being used to create long pieces of prose. The only real usage I could see is within party invitations or something of that sort. Still, this creates a problem. Some of the character’s BaBoon chose to represent are obscure and hard to identify. If you have to spell out a word using some of those decorative letterforms, then some people may not get the overall purpose of why you are using human or “monster” type font elements. For example: The capital “B” in the Sesame Street design is easily recognizable as Big Bird. However, if you were to use “A,” “Y,” “X” without using one of the easily recognizable characters; would people get the purpose without the aid of someone they can easily recognize? Anyway: The concept of creating your own typeface through fictional characters is highly creative. 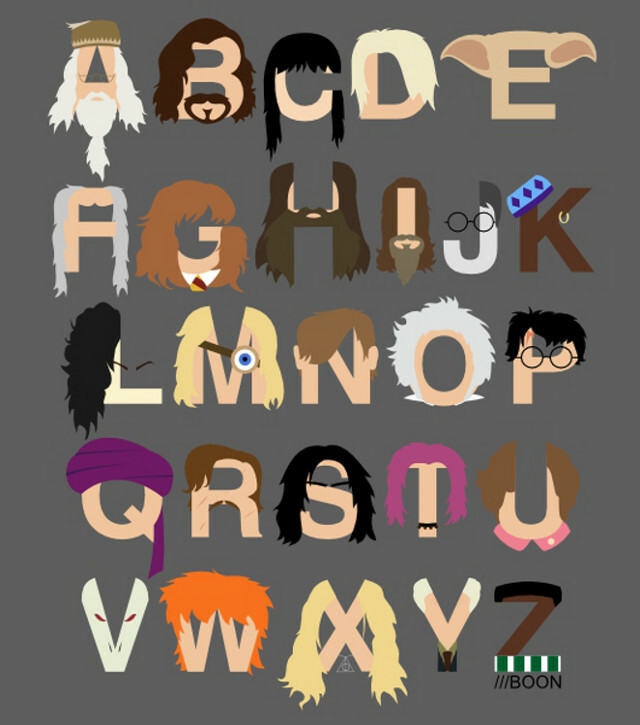 I enjoy how he represents various characters from these two fictional worlds through typography. Still, the practicality makes me wonder: Is this really practical? Hmm….